A little more than 50 years ago, my grandparents and my dad found themselves at the intersection of Virginia and Plaza Streets in Reno, Nevada. The sky was blue, the air was warm—it was summertime. As they approached the historic Reno Arch, my grandfather took out his Konica rangefinder and fired a single shot. In that photo, he captured not only the arch, but also the hustle and bustle of a regular day in the Biggest Little City in the World. Signs sprouted from pretty much every surface, urging travelers to get married, pump gas, park for 12 hours, watch entertainment for 12 more and then grab some “Real Good Food to Go.” Go? Go. Go! Go to Harold’s. No! Harrah’s—1/2 a block away! Why? The Silver Dollar Club is right there, right by the Phillips 66 station. There’s a Standard Station across the street. Wait a second…why do any of that when you could go to the Motel Mark Twain with its heated pool? 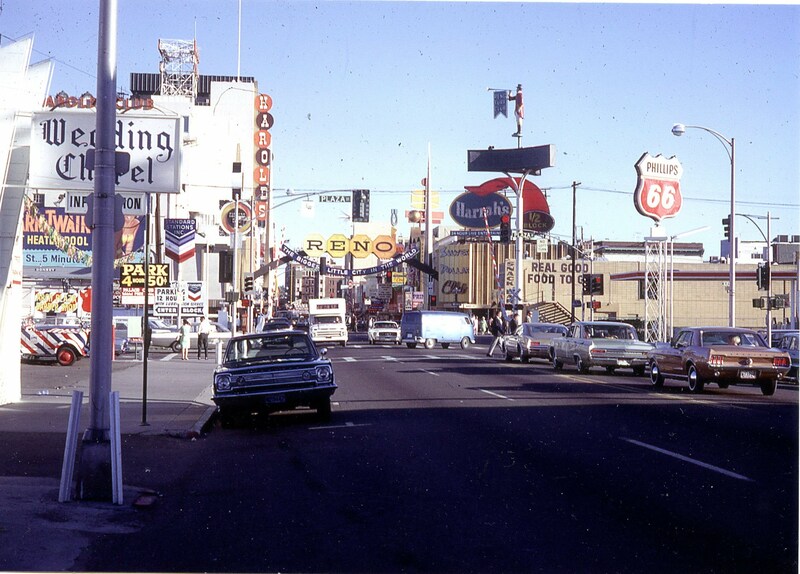 During those days, Reno was an information overload. Nonetheless, it certainly warranted a picture for my grandpa, grandma and dad, who were more than 2,000 miles away from their Detroit home on one of their annual cross-country trips. My grandpa was a teacher-turned-principal and my grandma was an elementary school teacher, so when the last bell rang each school year, they packed up their ’64 Chevy wagon and hit the road for some much-needed summer vacation. My dad was an only child, so naturally he came along for the ride. When I was younger, all three spoke fondly of these freewheeling adventures. My brother and I listened closely as they told colorful tales of the American West—a place that, even then, was vanishing far too quickly. We heard about oppressive heat, handgun hunting, pop-up campers and encounters with real cowboys, but we never saw photos. We knew they existed, but they were just out of reach. That all changed last winter when my dad started unearthing box after box of dusty slide carousels from my grandma’s closet. He was working on a photo project, and I immediately jumped on the opportunity to get a glimpse of a rarely seen chapter of Ukrop family history. Over Christmas, we dimmed the lights, fired up the projector and flipped through the slides, bringing back a flood of memories for those who were there more than half a century ago. As I advanced the slides, I studied them as closely as I could. There were people I knew and people I didn’t, places I had been and places I only dreamt of going—all dancing on our living room wall in stunning Kodachrome. A few weeks later, my dad sent me a letter and included a pair of 4×6 prints. One was of Freemont Street in Las Vegas circa 1968, and the other was the shot from Reno you see here. At first glimpse, it’s just a neat old photo that may be able to sneak onto the “Vintage Shots from Days Gone By” thread—but then you see it. On the left side of the frame, there’s a ’28 Model A Phaeton. It’s full-fendered and it looks as if the windshield has been chopped. The full wheelcovers suggest a suspension upgrade and/or a rearend swap (juice brakes, maybe? ), and a tonneau cover has been fitted over the rear seat area. 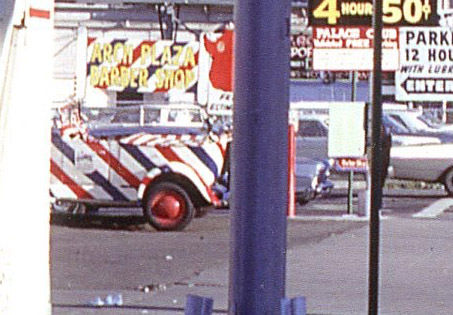 Sure, a solid red, blue or black paintjob would do this car wonders, but instead it was given the barber-pole treatment to advertise for the local Arch Plaza Barber Shop. This is the only picture I’ve ever seen of the A, so its other critical details like driveline and front suspension remain complete unknowns. Even in the sea of signs, the Phaeton immediately drew my eye. 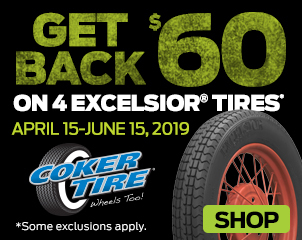 It’s some well-thought out advertising that’s sure to appeal to gearheads, regardless of the era. More often than not, I find myself looking at each and every car in a vintage photo, picking out the detail and taking a whole lot of mental notes. There was plenty to see out on the streets back then, and you never know when vintage tin will find its way into the shot. As hot rodders, it’s our job to scope it out. I’m glad it happened to show up on that summer day in Reno all those years ago. 12 Comments on the H.A.M.B.